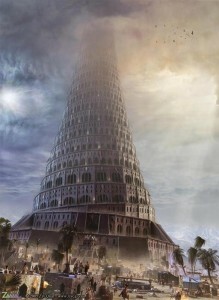 You know the Tower of Babel story. The ancient people living on the plain of Shinar said, Come, let us build ourselves a city and a tower with its top in the heavens, and let us make a name for ourselves, lest we be dispersed over the face of the whole earth. (Genesis 11:4) The Mesopotamians’ had one aim: to make a name for themselves. God is not present in their aim. They are aiming at their own greatness. And in these ancient Babel-onians we can see a picture of ourselves. Like them, we are sinners too often full of pride and selfish ambition, giving way too much thought about what others think about us and what our legacy will be. Like them, we too often have a ridiculous, exaggerated desire for our own glory and can put great effort into marshaling our resources and systems to achieve it. But here’s how God responded to the Ziggurat of human pride: And the Lᴏʀᴅ came down to see the city and the tower, which the children of man had built. (Genesis 11:5) The fact that God “came down” to view what men had built puts us all in our place. As Nass eloquently said, “God always has to ‘come down’ to examine our ant hill achievements built in the sidewalk cracks of his creation.” And so in his Trinitarian counsel, the Lᴏʀᴅ said, “Behold, they are one people, and they have all one language, and this is only the beginning of what they will do. And nothing that they propose to do will now be impossible for them. Come, let us go down and there confuse their language, so that they may not understand one another’s speech.” So the Lᴏʀᴅ dispersed them from there over the face of all the earth, and they left off building the city. (Genesis 11:6-8) Let us make no mistake. God was not feeling threatened in his supremacy by collective human ingenuity. Rather, what God knew, and what the city builders did not know, was the devastation that sin would wreak if human pride were allowed to progress unimpeded. And God does the same kind of merciful confounding in our lives. And it is far more merciful than we know, certainly more merciful than it feels when we feel confounded. We often do not know what we are really building when we embark on our achievements. We often aren’t aware of how deep, pervasive and motivating our pride is. We often are blind to how much we cherish the glory of our name. But God knows. And in mercy he confounds us, impedes us, and humbles us. And it is all mercy. “God opposes the proud but gives grace to the humble” (1 Peter 5:5). When it comes to his children, God gives us grace in the act of opposing our pride because it makes us humble. For he knows that the more humble we are, the happier we are. The proud will be destroyed (Proverbs 16:18), but the humble will dwell with God (Isaiah 57:15). The story of the tower of Babel contains a gospel treasure: even our disorienting disappointments and failures in making a name for ourselves have redemptive purposes. God loves us and knows what is best for us and in mercy he will not allow any achievement that we pursue for our own glory to rob us of the surpassing worth of knowing Christ Jesus (Philippians 3:8). There is no real gain in in making our name known. That’s Philippians 3:8 rubbish. The only real gain is Christ. So God mercifully thwarts our pride-fueled plans in order to make us truly happy. Jon Bloom is president of Desiring God and author of Not by Sight (2013) and Things Not Seen (July 2015). He lives in the Twin Cities with his wife, Pam, their five children, and one naughty dog.